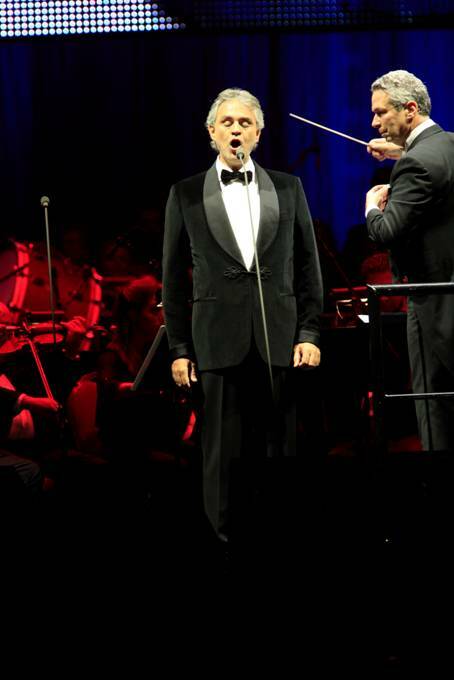 SAN JOSÉ, CA— The United States Tour of Italian Tenor ANDREA BOCELLI started majestically at the HP Pavilion in San José, California, on November 23rd with a one-night concerto featuring Cuban soprano MARIA ALEIDA and guest artist Welch Mezzo-Soprano KATHERINE JENKINS, the most prolific classical cross-over artist. The music was played by The LOS ANGELES FESTIVAL ORCHESTRA, which is composed of the finest studio recording musicians in the United states, and was conducted by EUGENE KOHN. Included in the program were the members of SAN JOSE STATE UNIVERSITY CONCERT CHOIR, Directed by DR. JEFFREY BENSON. Inside the Pavilion, a large screen over the stage showed a projection of the golden-bathed skyscrapers of downtown San José at night, with their lights on. Standing to their left of the buildings, towering over them, was a large picture of the tenor, dressed in a white shirt, jacket and tie, smiling, holding a microphone in one hand. Written in big letters over the blue sky were the words “ANDREA BOCELLI CONCERTO, ONE NIGHT IN SAN JOSE". Written on the program were BOCELLI's words explaining "The Responsibility of Talent": “I don’t think one decides to become a singer, It is decided for you by the reactions of the people around you.” The reaction of the people around him on that night, was love and admiration. Every seat in the Pavilion was filled. The two-part concert felt short. It left those hundredths of fans who wanted to see him and hear him sing, in person, wanting for more. A reason was that BOCELLI was “in voice” that night. When he sang, he let the audience hear his operatic arias in a deeper-sounding timbre of voice, a more fluid tone, and a new vocal technique which permitted the singer to expose the richness of his lower tones and slide up his scales smoothly reaching his higher notes with masterly, with ease without forcing their sounds in his throat. On that night, BOCELLI’s voice sounded lovely. The first number in the program was Herold’s ( 1791-1833) ZAMPA OVERTURE” from the ópera of the same name, a multi-rhythmic, multi-tambre orchestral piece which displays the sounds of the different instruments. In parts, one hears each instrument clearly in slow tempo, while in others all the instruments seem to run from Lento to Prestissimo until all seem to burst into a explosion of sounds. The piece ended in a fugue, with the theme jumping from one group of instruments to another. At the bang of the drum, the rhythm became faster and faster simulating a group of horses in gallop. It was a good opening number, well directed and played masterfully by the orchestra. Dressed in a black tuxedo, tenor BOCELLI entered the stage and was received with applause. Silently, he walked to the center and began singing Donna Non Vidi Mai (I had never seen a woman like this) from the Opera Manon Lescaut de Puccini. His tone was full, powerful, yet mellow in sound. It was a good interpretation. The aria was followed by the aria Di Quella Pira from Verdi’s Il Trovatore. In her Ah Je veux vivre from Roméo et Juliette Cuban Soprano MARIA ALEIDA, a resident artist at The Academy of Vocal Arts in Philadelphia, gave the audience a thrill when she sang masterfully an aria from Gounod's opera, as scenes from the opera were projected on the screen. For a concert, it was a very expressive rendition of the aria, using the correct pauses. The high tones of the soprano had the sound of a flute, specially singing her melismatic (groups of notes moving up and down the staff at great speed) passages. She hit her highest notes with the softness of a flying bird taking off. Beautiful to listen to, also and from the same ópera, was Ange Adorable, her duet with BOCELLI. On his part, the tenor gave us an excellent rendition of Ah Leve-toi Soleil (I leave you alone) from the same Opera, made more dramatic by the projection on the screen of the tenor, dressed as Romeo, and ALEIDA, dressed as Juliet, in her tomb, at the moment she awakens from her sleep and discovers that Romeo, thinking that she was dead, had drank poison. The best aria the soprano sang on that night was ‘O Luce di quest’anima from Donizetti’s Linda di Chamounix. The aria allowed ALEIDA to display the beauty of the tones of her lyric timbre and demonstrate her mastery in vocal technique as her voice slided up and down the scales hitting the high notes with ease, delighting the audience. 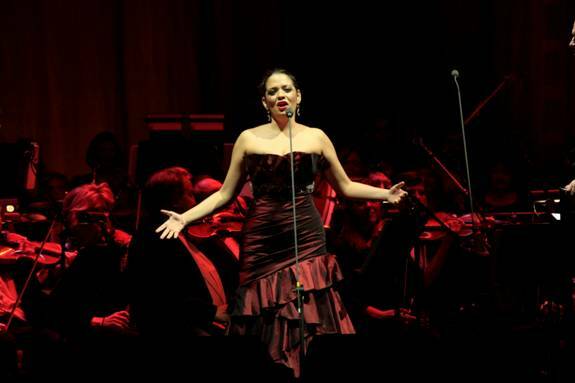 Cuban soprano MARIA ALEIDA in BOCELLI’s U.S. TOUR IN S.J. Tenor BOCELLI ended the act with lively dynamic rendition of Brindis from Verdi’s La Traviata enhanced by the voices of the SAN JOSE STATE UNIVERSITY CONCERT CHOIR. Special guest, Welch Mezzo Soprano KATHERINE JENKINS, the world’s most prolific crossover artist, interpreted a good solo that night in a warm-tone and sang a beautiful duet with the tenor as the English words were projected on the monitor behind the stage. After the duet of the Merry Widow Waltz de F. Lehar, with projections of the Opera in the screen, showing a party where the guests aredrinking champagne and dancing, the concert turned religious. During this part BOCELLI, considered one of the most loved recording artist in the world, sang Ave Maria from Schubert, with projections of a large statue of the Virgin Mary inside a church. The song could have felt more reverent if the tempo of the music had been slowed down a little to give it more feeling. With a projection representing the inside of a gothic cathedral, BOCELLI sang a powerful “Adeste Fideles,” a traditional Christmas song, accompanied by the choir and ended the concert. The applause was so long, that the tenor was encouraged to sing three encores: “New York, New York” which he sang in perfect English, with projections of New York City and himself in different N.Y. places, projected in the screen, his theme song “Con te Partiro” and “Nessun Dorma from Puccini’s Turandot which sounded marvelous.